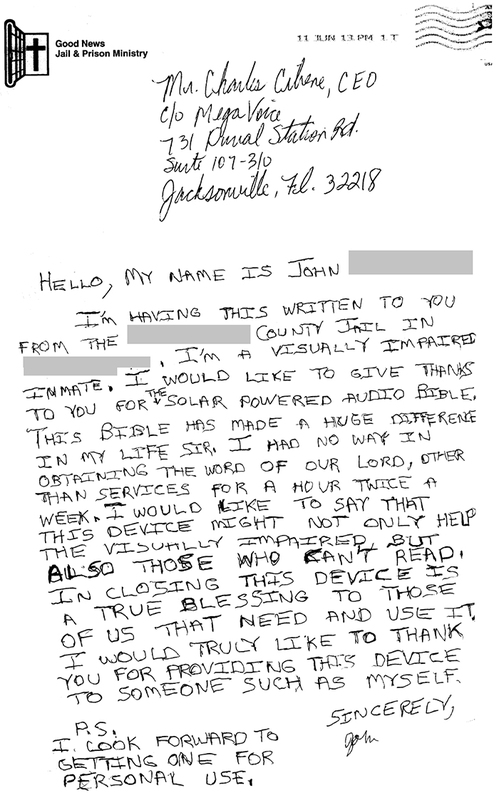 Our office recently received this touching postcard from a visually impaired man in a US jail. Hello, my name is John, I am having this written to you from the ——— County Jail in ———. I am a visually impaired inmate. I would like to give thanks to you for the solar-powered audio Bible. This Bible has made a huge difference in my life sir. I had no way in obtaining the Word of our Lord, other than services for an hour twice a week. I would like to say that this device might not only help the visually impaired, but also those who cannot read. In closing, this device is a true blessing to those of us that need and use it. I would truly like to thank you for providing this device (MegaVoice) to someone such as myself. I look forward to getting one for my personal use. Would you please consider a donation to MegaVoice International so we can send 25 more MegaVoice audio Bibles to the chaplain at this jail? Together we can do it – we are trying to raise $1000 to manufacture the players, load them with Scriptures and send them along to John and the other inmates. Any gift is GREATLY appreciated and will be used for this Gospel effort.